A poll of Americans Friday found that a significant portion of Americans are concerned about climate change–with 57 percent of Americans saying that long-term effects will be “very serious”–so it may not be exactly reassuring that some experts believe the recent blizzard that hit New York City and New England was fueled by climate change. 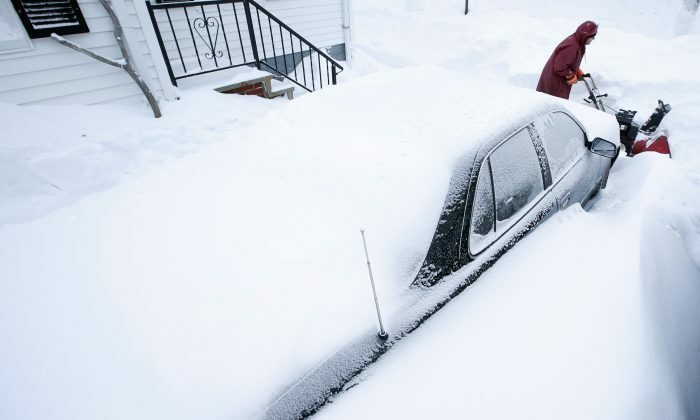 Due to climate change, winter storms–like Winter Storm Juno–could actually become more common. “Essentially as ocean temperatures warm, there is more water vapor in the air. This produces more snow when there is a contrast between cold land temperatures and warmer Gulf Stream and water temperatures,” Manhattan College professor Dr. Pamela Chasek explains told Epoch Times. “Winter storms could become more common. In fact 5 of New York’s biggest snow storms have occurred since 2000,” she noted. Dr. Chasek, however, cautions there’s a lot of uncertainty surrounding that assertion. “Like everything with climate change, there is still a lot of scientific uncertainty and other variables that have an impact on weather (remembering that climate and weather are not the same things),” she stressed. According to the U.S. Environmental Protection Agency’s most recent data, the average temperature of the world’s oceans has increased 0.5 degrees since the early 1980s. “Overall, the world’s oceans are warmer now than at any point in the last 50 years. The change is most obvious in the top layer of the ocean, which has grown much warmer since the late 1800s. This top layer is now getting warmer at a rate of 0.2°F per decade,” says the EPA. The agency adds that oceans–the surface level and the deep part–will continue to get warmer and warmer. “Warmer oceans affect weather patterns, cause more powerful tropical storms, and can impact many kinds of sea life, such as corals and fish. Warmer oceans are also one of the main causes of rising sea level,” it adds. On Friday, a poll from the New York Times, Stanford University, and environmental research group Resources for the Future found two-thirds of Americans have said they are more likely to vote for political candidates who want to fight climate change. The poll found Americans are also less likely to vote for candidates who deny or question global warming. “The poll found that 83 percent of Americans, including 61 percent of Republicans and 86 percent of independents, say that if nothing is done to reduce emissions, global warming will be a very or somewhat serious problem in the future,” said the Times in its report.